Pixelmator today announced that it will be bringing a full-fledged version of its popular image editing app to the iPad, first showing it off at Apple's special media event earlier today and giving more details on its blog. Like the Mac version, Pixelmator for iPad is a layer-based image editor that allows users to edit images in a non-destructive fashion and create illustrations. The app features a painting engine with retouching tools for photos, a touch-optimized painting engine, and a number of effects for typography, shapes, and more. Pixelmator for iPad also is compatible with Photoshop documents and can work with Pixelmator for Mac through iCloud or through OS X Yosemite's Handoff feature. Pixelmator for iPad will sell for $4.99 when it launches later this year. I already have iDraw on iPad, now Pixelmator, this is really exciting, Can't Wait. $4.99 is a steal. Instant buy. Also, a big thumbs up to the Pixelmator guys if they read this. Fantastic product. Adobe's subscription model has brought them in to the spotlight, but they were great well before that. 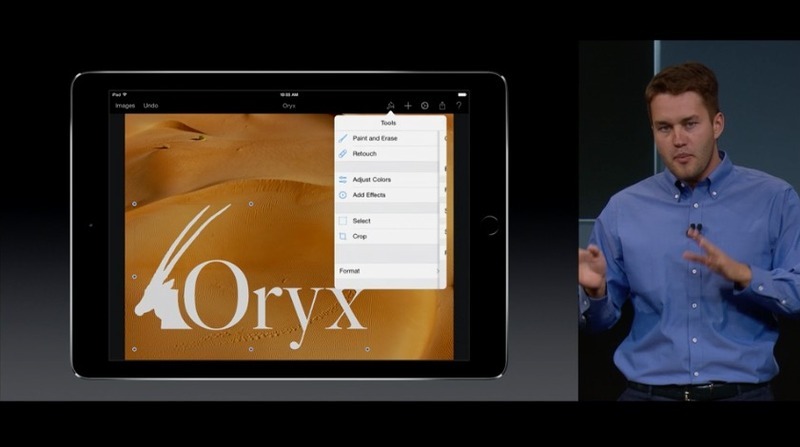 This was probably the highlight of the keynote for me. Was always going to be an instant purchase when released and I'm really looking forward to it. A steal at twice the price (for that matter, so is the Mac version). iDraw quickly shot down in price today after the announcement. I had it on my price watch list in AppTicker Push. And yet Adobe keeps crippling its licensing models. Such as offering Lightroom for iPad only through subscription. Or CS6 being the last offline Creative Suite. ....to add, but to say I'm very happy about this also. This and iDraw really kill the 'the iPad is just a toy' argument. At least for my usage. I bought iDraw too. Hahaha. To be fair, they're both different products. Pixelmator for me is an instant buy. They'll always be on my devices. They are affordable and attentive.